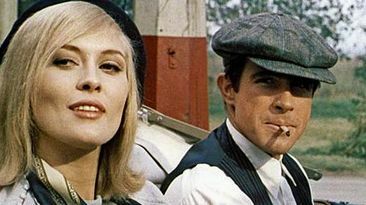 Is Bonnie and Clyde (1967) a gangster film with a love subplot? Or is it a romance with a violent streak? It certainly creates a space to ask this question, and thus precedes a long line of murderous romances: Badlands, Wild at Heart, True Romance, and Natural Born Killers, among others. What's amazing about Bonnie and Clyde - aside from its unflinching approach to on-screen violence - is the fact that the film has the feeling of a relationship, rather than a getaway (unlike The Getaway, also discussed this month). The tone of the film, driven by excitement, uncertainty, danger, and complete abandon to the dictates of the moment, is easier to understand as a representation of young love than of criminal psychology. Bonnie Parker and Clyde Barrow had the kind of mutual devotion that's standard-issue with first love. They meet in a Romeo and Juliet sort of stage, him trying to steal her car while she calls out to him from a window: Thus Clyde serenades Bonnie with crime, and Bonnie, bored and sheltered with her elderly mother, can't help but listen. In these initial scenes, Clyde seems dormant, with a confidence that still needs to be activated. He's recently-paroled and hasn't started really pushing his boundaries, and with Bonnie, he's a stallion, rather than a devoted partner, his primary goal being acquisition. To this end, he creates an idealized image of Bonnie, and then he spends all his energy making inane attempts to impress her. He's effective in these methods, just as he's effective as a bank robber, managing through sheer audacity to sneak into Bonnie's quiet little world and steal her heart and her life from it. Now, Crowther doesn't feel this reading justifies what he sees as the movie's shortcomings. Perhaps he would have been more convinced if he had seen the connection between this capricious violence and the other emotional anchor for the film, the theme of capricious love. In fact, Clyde in particular seems reasonably well-informed about the potential consequences of violence, even urging Bonnie to leave him when they murder a bystander in one of their bank robberies. He also makes an unsuccessful attempt to hide out to avoid entangling his brother... he knows they'll be put in danger, and perhaps become consigned to lives of crime and paranoia. Unfortunately, the ties of love and family pull them all into the same impossible situation together. On the other hand, Clyde and Bonnie seem fully unprepared for the roller-coaster emotions of love. The film has the sense of giddiness and narcissism that comes with adolescent romance, and one of the driving forces in the movie is the chemistry between the suave Beatty and the beautiful Dunaway. It's a rapid heartbeat kind of film, imbued with surprising emotional dynamics, layered over situations that are surprisingly typical of rom-coms. The conversation between Bonnie and Clyde in a diner, right toward the beginning, is reminiscent of the diner scene in When Harry Met Sally (1989), when the characters are first negotiating their feelings about one another. In between heists and murders and escapes, there's also a couple tense, tender scenes of intimacy, and two "meeting the family" scenes, exploring the complexity of inter-familial relationships. It turns out that Bonnie and Clyde have to face some difficult realities as their love develops. Clyde has to deal with Bonnie's occasional outbursts, her animosity toward Blanche, her wish to visit her mother, and her fantasies about returning to a normal life. Bonnie has to deal with much more concrete problems from Clyde, who didn't always know how to back up his big talk; he also dismisses her need for privacy and intimacy, and occasionally berates her in front of his brother. It seems that, to adapt the words of Mr. Crowther, love is "an abstract and unconsidered thing" in the minds of these careless, flagrant romantics. Bonnie and Clyde is often spoken of alongside Easy Rider (1969), another recent Renegade April subject. After all, both were late 60's movies about a pair of criminals on the run, both were experimental and self-conscious movies, and both ended in sudden tragedy. That said, it's just as interesting to note the difference between Bonnie and Clyde, the public enemy outlaws resurrected in Arthur Penn's film, and Billy and Wyatt, the motorcyclist drug-dealers of Easy Rider. Wyatt and Billy were unapologetic loners, true outsiders taking a detached journey through the Southern United States. Bonnie and Clyde, by contrast, were aggressively active. They were citizens of the nation, drumming up public opinion, seeking notoriety, and proclaiming their identities wherever they went. Needless to say, these represent opposite sides of the coin of rebellion. There's a massive gulf between the way of the gun and the way of the dove, but as characters like Billy and Wyatt discovered (along with real people like Martin Luther King), even the peaceful, enlightenment-seeking stoner's road leads to self-destruction when it's paved through an entirely unsympathetic world. And for Bonnie and Clyde, at least this difficult path was under love's streetlight, and at least they made a mark on the goddamn world, going out with their guns blazing. Am I celebrating violence? I guess it kind of sounds like it... but as I said before, with Bonnie and Clyde, the celebration of violence goes hand-in-hand with the celebration of love. For these two, whose relationship was dogged by predictions of death ("I'll bring flowers to their graves," says an old man), misguided rage and burning romance are part of the same flickering passion, always doomed to be extinguished. At least Bonnie and Clyde never had to look at each other over a campfire and say, "We blew it." First, thanks for the comment on my blog. As you can see, I'm prone to quick outbursts, as opposed to your more expansive discussion. And an enriching discussion it is. I liked the Romeo & Juliet connection--and taking old Crowther to task. One thing I alluded to that I don't see you considering: Clyde's all-but-impotence. What do you make of that? Is he repressed--letting it all out in violence? The scene in the car when he stammers that he's "no lover boy," then adds he doesn't like men--and springs backward out of the car, hitting his head, an embarrassing moment--this unwillingness on his part is repeated later, and Bonnie, frustrated, calls him on it. I'll add nothing new here; the Freudian subtext is not all that sub. Have you seen the 1949 Gun Crazy? It's famous on its own right--and also noted as a forerunner to B&C.